City Tours Europe: bus rental, bus trips, guided tours, event planning, etc. City Tours Europe is a very versatile company with many various activities in the fields of tourism, languages and culture. We are very proud to be a multilingual and multicultural team that do not regard only their own country, but the whole European continent as their fatherland. We are staunch Europeans and thanks to our services, we would like to contribute to making Europe a little closer. This is why we are making our best to make freedom of travel even more accessible to our customers by making easier the booking of tourist services in every European countries. To make it clearer, our actual activity is to help outgrowing language and culture related boundaries in Europe while saving time and trouble to our customers. Bus rental all around Europe: the main activity of City Tours Europe is by far bus rental for sightseeing tours, bus transfers, excursions and motor coach trips all around Europe. For that purpose, City Tours Europe works together with an extended network of carefully selected, reliable and highly qualified bus traders all around Europe and acts as a mediator between the customer and the bus company. The advantage for the customers: they can speak anytime with a member of the City Tours Europe team, in any of City Tours' working languages and are regarded by the bus company itself as if they were old regular customers of their's. Organization of bus trips in Europe: this service does not yet cover the whole Europe surface but is already available in most European countries: City Tours Europe can take care of the planning, organization and execution of tailor-made bus travels for private groups, including organization of the bus transportation, sightseeing programme, accomodation and restaurants. In some places, we do also sometimes offer public bus trips to interesting destinations - the number of these public travels open to reservation for single travellers should raise in the next few years. Car rental with driver or driver guide services: in some places, City Tours Europe also offers car rental with a driver or a driver guide. Organization of incentives in Europe: in some places, especially in "City Tours heartland" - Austria, Bavaria, Trentino and Veneto - City Tours Europe can organize tailor-made incentives for business customers. Professional guided tours all around Europe: thanks to a very large network of professional freelance tour guides all around Europe, City Tours Europe offers high-quality and entertaining city walking tours, museum visits and bus city tours with guide service. Thanks to frequent work with the same reliable tour guides and to regular analysis of our customers's feedback, City Tours Europe is now able to guarantee constant high-quality services all around Europe as far as guided tours with licensed tour guides are concerned, and thus to keep its customers from bad surprises. Ticket reservation: City Tours Europe acts as a ticket office mainly in combination with further services, especially with the organization of sightseeing tours and bus trips - but also in some places as a totally independant service. As a ticket office, City Tours provides its customers with entrance tickets to museums and exhibitions as well as admission tickets and seats in shows, theater performances, concerts, etc. Translation services: considering that City Tours Europe itself needs translation everyday for its own tourist activity, we are employing for our own needs both in-house translators and freelance translators. We want to make the most of this situation by offering translation services in many languages - German, English, etc. - to our customers and partners. 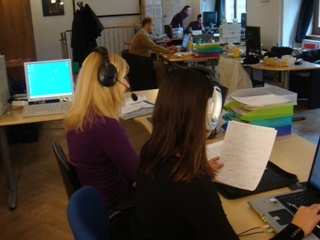 Interpretation services: just like translators, we very often need interpreters in our everyday work as a tour operator. We also use both in-house interpreters and freelance interpreters and therefore possess excellent knowledge of the skills and working methods of many professional interpreters all around Europe - a precious know-how that we would like to share with our customers and partners in Europe by providing them with all kinds of interpreter services. Event planning: when acting as an event agency, the City Tours Europe team use their knowledge and abilities from all their working fields to offer the planning, organization and execution of smaller and bigger events and ceremonies. Please note that we do not yet offer this service everywhere in Europe, but mainly in City Tours' "heartland", including Austria, Bavaria, Trentino and Veneto. Talent agency: City Tours Europe can provide you with Austrian artists for performances of any kind all around Europe. We are currently working on extending this service as soon as possible and offering artists from other European countries. More information about City Tours' services?